Scenic oceanfront views are captured through 30 foot tall sliding glass doors that open and flood the villa with island breezes and natural light. An enormous open-concept living area, with spectacular ocean views throughout, has two separate seating areas with sectional sofas plus a 55-inch flat screen TV with Apple TV and stereo for the whole family to enjoy. A fully renovated gourmet kitchen includes all new appliances, granite countertops, and a wet bar with separate ice maker. A propane grill on the side of the house is available for cookouts. Only 250 yards from the Rum Point Club, Kai Vista boasts an exceptional location on top of its luxurious amenities. A sandy beach offers long walks in either direction with plenty of privacy. In addition, guests can explore the reef using two complimentary tandem kayaks provided by the homeowner (signed waiver required). We advise divers and snorkelers to wear pool shoes or fins when out in the water to avoid injury. — For bookings made outside of 60 days prior to arrival, a 50% deposit (of rent only) is due in order to confirm your booking. The remaining 50% balance plus taxes and fees is due 60 days prior to arrival. — For arrivals within 60 days, the entire balance is due in order to confirm your booking. — For cancellations outside of 60 days, half of the 50% deposit is returned minus a 2.50% credit card processing fee. We then re-open your dates on the calendar. Any dates we can replace are fully refunded minus the credit card processing fee. Should we fail to re-book any dates, the remaining deposit is forfeited. — For cancellations within 60 days of arrival, all taxes and damage deposits are immediately refunded. We then re-open your dates on the calendar. Any dates we can replace with a new booking are refunded to you minus the credit card processing fee. Should no dates rent, the remaining balance is forfeited, however, guest will receive a credit for 50% of rent lost for a subsequent similar stay at the same villa taken within 13 months. We strongly recommend purchasing CSA Travel Insurance to offset unforeseen cancelations, medical emergencies, or travel delays. 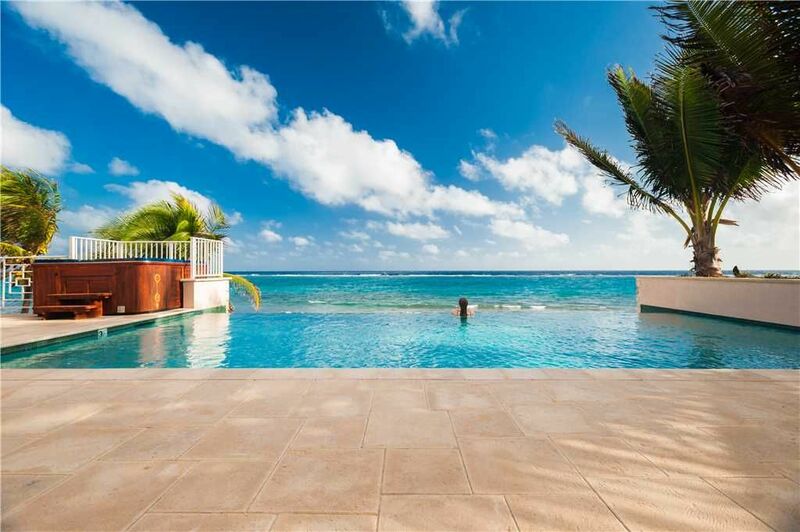 Managing over 70 oceanfront villas and booking over 250 condos on Seven Mile Beach, Grand Cayman Villas & Condos offers the largest inventory of bookable vacation properties on Grand Cayman. With it's on-island hospitality company, Silver Thatch, Grand Cayman Villas & Condos has raised the bar on guest services. A newly built welcome center was designed with the guest’s vacation needs in mind and includes a private fitness studio, and business center. Our dedicated staff is prepared to assist with charter and reservation recommendations for family dinners, snorkel safaris, or at-villa services like grocery delivery, massage treatments, private chefs, and more. In addition, guests can conveniently check-out complimentary snorkel gear, baby equipment, coolers, bluetooth speakers, Apple TVs, and other items to enhance their vacation experience. Call or email us any time with any questions you may have and we will be happy to assist. A fully renovated gourmet kitchen includes all new appliances, granite countertops, and a wet bar with separate ice maker. A beachfront sundeck with plush loungers. Complimentary snorkel gear is available at our Silver Thatch Welcome Center. The house was beautiful with a tremendous location to enjoy the sounds of the beach and incredible views. The house itself was plenty spacious for our party of six. Only suggestion would be to upgrade the couches as they are getting a bit worn, but still adequate. All other ammentities are tremendous. They delivered a brand new hot tub while we were there. That made our week! We had a great time and enjoyed our time on Grand Cayman and our stay at Kai Vista! We loved our time at this house that sits right on the ocean. The house is very well equipped and outdoor/ indoor space is just perfect. Great view. And, if you like snorkeling, it is amazing. The house is located in a good spot . Very quiet, secluded neighborhood. The seashore shalow and uneven, but very pleasent once you get in. We can say only positive about the house. Staff was really nice and accommodating. We are hopping to visit soon. The house was everything we had hoped and more. With the abundant marine life we have in the water you will want to wear pool shoes or fins for foot protection. The prevailing trade winds from the east make flying insects less of a nuisance��many of the homes in Rum Point don’t even need a screened porch.